Superman” actor and disabilities activist Christopher Reeve often traveled the country to visit teams of neuroscientists working to discover possible treatments for spinal cord injuries. A framed photo of Reeve during one such visit — in his wheelchair with his portable ventilator, the result of a horseback-riding accident — sits prominently today in the office of Gordon Mitchell, Ph.D., a pioneering researcher known internationally for his innovative studies concerning how to strengthen breathing and other movements among those with severe spinal cord injuries. The photo of the late movie star-turned-activist serves as inspiration to Mitchell, who came to the Evelyn F. and William L. McKnight Brain Institute and the department of physical therapy at the University of Florida from the University of Wisconsin at the end of 2014 to found UF’s Center for Respiratory Research and Rehabilitation and advance efforts to develop therapies for one of medicine’s most vexing conditions. “I once saw Christopher Reeve speak, and during his talk, he expressed that his greatest fear was that the power would go out — and that would mean the ventilator that sustained his life would stop,” said Mitchell, preeminence professor of neuroscience in UF’s College of Public Health and Health Professions. So, while the inability to walk may be the most visible sign of a spinal cord injury, for those most severely injured, it is the inability to breathe on one’s own that poses the gravest danger and creates the most fear. Hypoxia is a word that makes some people brace. Defined as “a deficiency of oxygen reaching the tissues of the body,” hypoxia can be quite harmful if taken to the extreme. Intermittent periods of hypoxia are one major consequence of sleep apnea, which contributes to high blood pressure, diabetes — even cancer growth. In the worst cases, hypoxia can be fatal. But what Mitchell has discovered is that modest intermittent hypoxia holds hidden benefits: He has developed a technique that involves breathing a lower level of oxygen in short, repeated bursts for a limited period to strengthen breathing ability. One remarkable surprise, Mitchell said, is that it also strengthens other movements, including walking and grasping. Mitchell is gaining confidence in the possibilities of this technique. Over more than two decades of research — including very basic molecular studies in rats and advancing in recent years to human clinical trials at collaborating institutions — he and his team have demonstrated that this technique shows promise as a potential therapy to improve breathing and other movements in people with chronic incomplete spinal cord injury, including those with quadriplegia, or paralysis from the neck down. This discovery could also have implications for many other clinical disorders that compromise the ability to breathe or move, including amyotrophic lateral sclerosis, or ALS, multiple sclerosis, post-polio syndrome, stroke and traumatic brain injury. It holds the promise of a potential low-cost, noninvasive therapy to build strength in multiple ways. 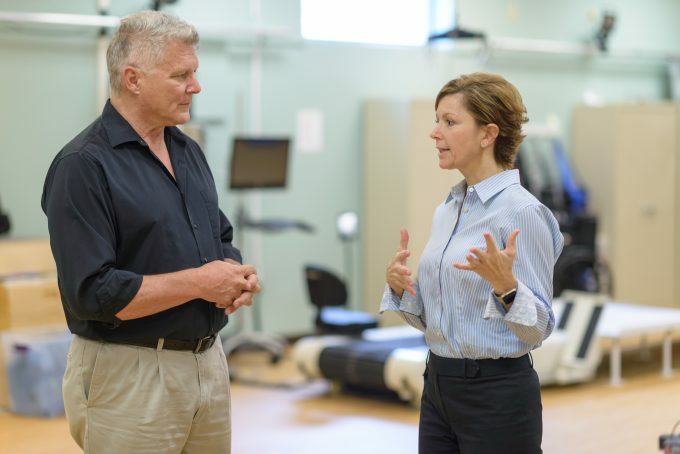 “The work we’re doing is really focused on helping those with spinal cord injuries to regain movements: Those movements would be breathing, arm movements like grasping, and it might even be standing up or walking,” Mitchell said. Monica Perez, Ph.D., of the Miami Project to Cure Paralysis, said while there’s still much to be learned about how intermittent hypoxia works in humans, preliminary data suggest the technique could be a significant advancement in the recovery from spinal cord injury. 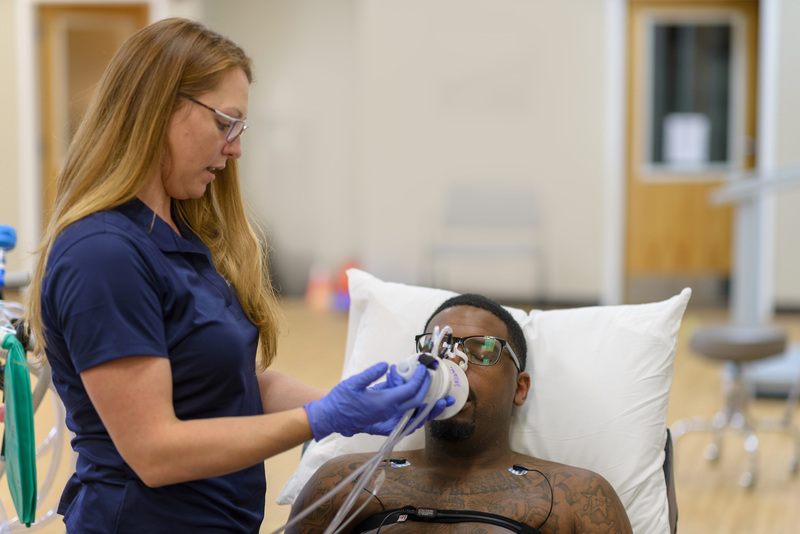 Now, Mitchell and co-principal investigator Emily Fox, D.P.T., Ph.D., are launching UF’s first human clinical trial to test their hypothesis that intermittent hypoxia improves breathing ability. Under a $2.4 million Defense Department grant, Gordon Mitchell, Ph.D., left, and Emily Fox, Ph.D., will test therapeutic intermittent hypoxia over four years. 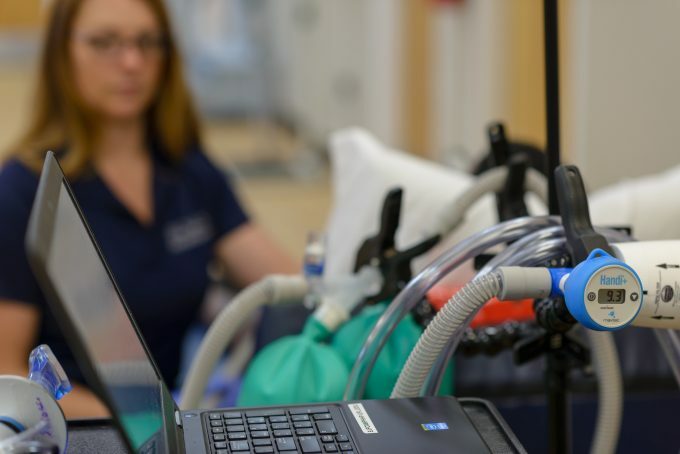 Under a new $2.4 million grant from the U.S. Department of Defense, Fox and Mitchell will test therapeutic intermittent hypoxia over four years in about 55 people with chronic spinal cord injuries in a collaboration between UF and Brooks Rehabilitation in Jacksonville. The clinical trial, starting this fall, will be carried out at the Brooks Rehabilitation Clinical Research Center. Using sensors attached to the skin to measure activity in the core muscles that contribute to breathing and additional sensors that measure blood oxygen levels and the amount and force of air being inhaled and exhaled, the research team will place a mask over a participant’s mouth and nose to alternate giving low-oxygen air (9 percent oxygen) for a minute, followed by normal room air (21 percent oxygen) for a minute, about 15 times in all. For the participant, the difference between breathing 21 percent oxygen and 9 percent oxygen for one minute is so subtle, Fox said, that most people are unable to reliably report whether they were breathing normal air or low-oxygen air. In current research efforts, the machine that provides the oxygen-reduced air is similar to those used by mountain climbers and endurance athletes who are training to compete in high-altitude environments. But as intermittent hypoxia research is taken to the next level, Mitchell is collaborating with engineers, including Neil Euliano of Convergent Engineering in Gainesville, to develop a standardized device specific to this use. Mitchell warns against any patients attempting this technique at home, as for now it remains experimental — and could be harmful if unmonitored by professional treatment providers. Dosages, frequency and duration are the focus of multiple ongoing studies. Furthermore, the ultimate safety and lasting benefits of intermittent hypoxia as a treatment have yet to be proven. The benefits appear to be temporary and to last from a number of hours to a number of weeks. Like exercise, the treatment most likely would need to be repeated regularly to maintain its benefits. Intermittent hypoxia works, Mitchell said, because it prompts the body to adapt to repeated changes in oxygen levels. When the level of oxygen reaching the tissues drops, the body has “watchdogs” that respond, he explained. These so-called watchdogs “are sensory neurons in your neck called the carotid body chemoreceptors, and when oxygen goes low — for even a very brief period — they are activated and tell your brain that something important is changing,” he said. The key is to activate the carotid body chemoreceptors and the neurons that contain serotonin while minimizing the amount of hypoxia in tissues throughout the body. By shortening the episodes of hypoxia, researchers are able to accomplish this goal. Once serotonin has worked its magic by triggering neuroplasticity, the motor nerve cells are more active, causing the diaphragm to make stronger contractions —making each breath deeper. After two decades of basic research on rodent models in an effort to understand this process and why it might work, Mitchell’s team started to translate their findings to humans in 2010, with clinical trials at partner institutions Emory University and the Rehabilitation Institute of Chicago. Thus far, Mitchell’s team and collaborators have published seven articles in high-profile journals indicating they can produce changes in limb movements. Because of greater difficulties working with ventilator-dependent patients, they began studies in those with less-severe injuries that impact walking and arm use. Now, they are turning their efforts to improving breathing in people with chronic spinal cord injuries. The initial studies demonstrated an increase in leg strength and substantial improvement in walking ability in patients who had no prognosis for functional gains. These were followed up with a preliminary study demonstrating improved hand function in people with quadriplegia, like Christopher Reeve had. But more research is needed before intermittent hypoxia could become a clinical treatment. “Eventually there will need to be a full-scale clinical trial involving multiple sites. Only after we understand the outcome of that trial, we’ll be able to really say this is a clinical treatment,” Mitchell said. In the meantime, there is much work to be done to prepare for that comprehensive clinical trial. Traditional goals of spinal cord injury research have focused on restoring the ability to walk. But to Mitchell, the goal has always been restoring critical yet perhaps under-appreciated automatic functions like breathing. Mitchell first became captivated by the process of breathing while studying diving mammals and marine biology as an undergraduate at the University of California, Irvine. He happened upon a comparative respiratory physiology lab, where he discovered a passion for understanding how animals control their breathing. Today, Mitchell has taken that early interest and become a worldwide leader, forming an international therapeutic intermittent hypoxia consortium to accelerate progress and, this past April, hosting a first-ever retreat that brought 130 researchers to Gainesville from as far away as Australia, France and the Ukraine. He has positioned UF for prominence in this field by bringing together researchers from UF and Brooks Rehabilitation, and by collaborating — rather than competing — with colleagues at other institutions who have multiple different studies now underway. As a physical therapist at Brooks Rehabilitation, Kate Cavka sees patients with spinal cord injuries in an outpatient facility, shortly after they’ve returned home from the hospital. She helps patients to set new, realistic, incremental goals. One aspect of treatment might be focused on walking again, but Cavka also highlights the importance of respiratory function, such as coughing: Muscle strength to keep the airway clear is essential to prevent pneumonia. Assisting with the intermittent hypoxia research gives Cavka a sense of hope. “As clinicians, we want to have as many tools in our toolbox as possible to maximize the number of interventions we’re performing in therapy, so we can achieve more: more functional capacity, more independence, better quality of life,” she said. One patient, 21-year-old college student Francois Fried, was left in a wheelchair from a dirt-bike racing accident in November 2016. While he has built core strength and improved his ability to move around through five-day-a-week physical therapy sessions, he feels his progress has began to plateau. During a recent therapy session, Fried said he was intrigued by the possibilities of intermittent hypoxia. “I hope they do a long-term study and see if we can get really good results out of it,” he said. Like Fried, many who have spinal cord injuries suffered them at a young age, with a whole life ahead of them. As time passes post-injury, hope tends to dwindle. The POST is a newsletter for UF Health.